A green building has four main elements or components on which it is designed: materials, energy, water and health to make green building more sustainable. Materials for a green building are obtained from natural, renewable sources that have been managed and harvested in a sustainable way; or they are obtained locally to reduce the embedded energy costs of transportation; or salvaged from reclaimed materials at nearby sites. Materials are assessed using green specifications that look at their Life Cycle Analysis (LCA) in terms of their embodied energy, durability, recycled content, waste minimisation, and their ability to be reused or recycled. Passive solar design will dramatically reduce the heating and cooling costs of a building, as will high levels of insulation and energy-efficient windows. Natural daylight design reduces a building’s electricity needs, and improves people’s health and productivity. Green buildings also incorporate energy-efficient lighting, low energy appliances, and renewable energy technologies such as wind turbines and solar panels. Passive solar design uses sunshine to heat, cool and light homes and other buildings without mechanical or electrical devices. It is usually part of the design of the building itself, using certain materials and placement of windows or skylights. The building should be elongated on an east-west axis. The building’s south face should receive sunlight between the hours of 9:00 A.M. and 3:00 P.M. (sun time) during the heating season. Interior spaces requiring the most light and heating and cooling should be along the south face of the building. Less used spaces should be located on the north. High energy performance: lower energy bills all year round. Investment: independent from future rises in fuel costs, continues to save money long after initial cost recovery. Value: high owner satisfaction, high resale value. Attractive living environment: large windows and views, sunny interiors, open floor plans. Low Maintenance: durable, reduced operation and repair. Unwavering comfort: quiet (no operating noise), warmer in winter, cooler in summer (even during a power failure). Environmentally friendly : clean, renewable energy doesn’t contribute to global warming, acid rain or air pollution. 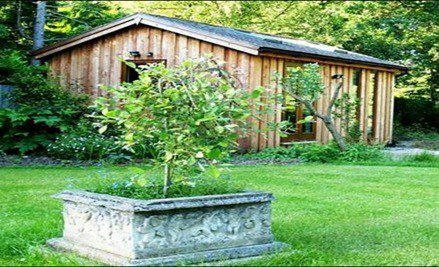 The goal of all passive solar heating systems is to capture the sun’s heat within the building’s elements and release that heat during periods when the sun is not shining. At the same time that the building’s elements (or materials) is absorbing heat for later use, solar heat is available for keeping the space comfortable (not overheated). Thermal mass to absorb, store, and distribute heat. Direct Gain: Sunlight shines into and warms the living space. Indirect Gain: Sunlight warms thermal storage, which then warms the living space. Isolated Gain: Sunlight warms another room (sunroom) and convection brings the warmed air into the living space. Minimising water use is achieved by installing greywater and rainwater catchment systems that recycle water for irrigation or toilet flushing; water-efficient appliances, such as low flow showerheads, self-closing or spray taps; low-flush toilets, or waterless composting toilets. Installing point of use hot water systems and lagging pipes saves on water heating. Rainwater harvesting is the principle of collecting and using precipitation from a catchments surface. An old technology is gaining popularity in a new way. Rain water harvesting is enjoying a renaissance of sorts in the world, but it traces its history to biblical times. Extensive rainwater harvesting apparatus existed 4000 years ago in the Palestine and Greece. In ancient Rome, residences were built with individual cisterns and paved courtyards to capture rain water to augment water from city’s aqueducts. Surface water is inadequate to meet our demand and we have to depend on groundwater. Due to rapid urbanization, infiltration of rainwater into the subsoil has decreased drastically and recharging of groundwater has diminished. As you read this guide, seriously consider conserving water by harvesting and managing this natural resource by artificially recharging the system. There are two main techniques of rainwater harvestings. Storage of rainwater on surface for future use. 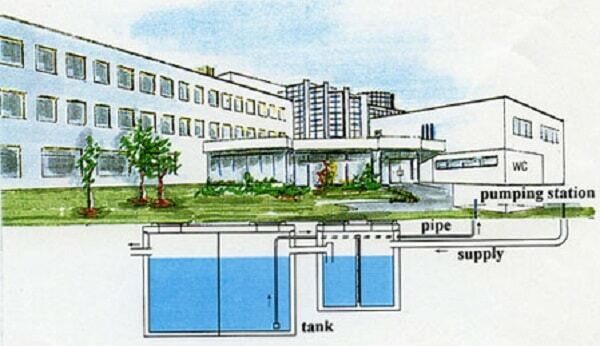 3.3.a) Storage of rainwater on surface for future use. The storage of rainwater on surface is a traditional techniques and structures used were underground tanks, ponds, check dams, weirs etc. Recharge to groundwater is a new concept of rainwater harvesting and the structures generally used are Pits ,Trenches, Dug wells, Hand pumps, etc. Using non-toxic materials and products will improve indoor air quality, and reduce the rate of asthma, allergy and sick building syndrome. These materials are emission-free, have low or no VOC content, and are moisture resistant to deter moulds, spores and other microbes. Indoor air quality is also addressed through ventilation systems and materials that control humidity and allow a building to breathe. In addition to addressing the above areas, a green building should provide cost savings to the builder and occupants, and meet the broader needs of the community, by using local labour, providing affordable housing, and ensuring the building is sited appropriately for community needs.